It’s the stateside version of the French gambling classic, so what else could they call it but American Roulette? Bet red or black, high or low and use your own system to hit the wins. Do you want that Las Vegas experience in your own home? Well look no further than the superb action and red hot thrills offered by American Roulette. This online casino version of the classic makes it incredibly easy to place your bets and hustle over the winning line. With prizes galore and a super smooth interface, this is one title you’ll want to play again and again. American Roulette is a standard Roulette game with a zero, double zero, inside bets, outside bets and racetrack bets. Place your bets using the chips available at the bottom of the screen at the appropriate points and places on the racetrack and grid. Use the X button to remove any misplaced bets. Use the Spin button to start a game. This removes the necessary funds from your account and the ball is set into motion around the virtual American Roulette track. When the ball stops in a segment of the wheel, all the winning bets are paid out and the player according to Paytable. This website is operated by Lottoland. Lottoland passes on Player’s Bets to EU Lotto, which is acting as a bookmaker. 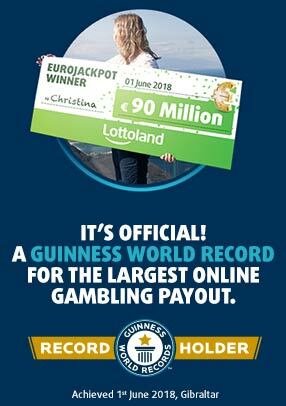 When placing Bets, Lottoland acts in the name and on behalf of the Player.EU Lotto Ltd. is licensed by the Irish National Excise Licence Office (Reference number 1011284). It is also licensed by the Gambling Commission for customers in Great Britain (licence: 000-038991-R-319408-005) and by the Government of Gibraltar and regulated by the Gibraltar Gambling Commissioner (RGL 085 & 066). © 2016 Lottoland Limited - Office Suite A, Ocean Village Promenade, Gibraltar (EU).Lotto Online.